It looks like I was way off on the “be prepared to sit on the bottom” thing. Can’t say I am sad to be wrong about that! 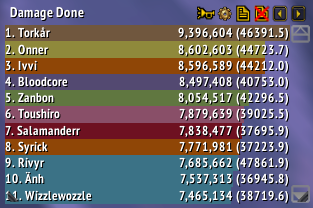 I was peaking at over 70k DPS with all my CDs up in the initial burst of BM. 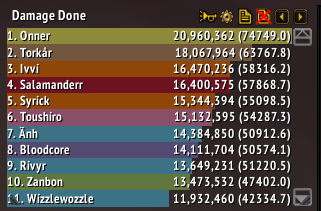 I can only imagine how much more I’d be doing with Stampede to add into the mix, plus I’m forging OUT of crit to hit EXP cap (which I’m slightly below due to my hasty and shoddy reforge job 10 mins before raid). You can’t Kill Command on Ultraxion and I’m told it bugs out on Warmaster drakes and Madness arms. I am told Lynx Rush bugs out on Spine. Lynx Rush is so much better than A Murder of Crows. 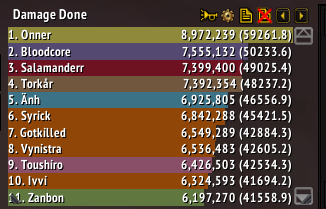 Raiding seriously as BM is amazing. 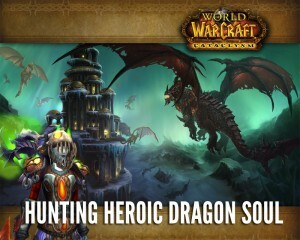 I look forward to finishing the raid tomorrow night. I’ll have some notes on SV raiding since I’m prolly going to have to do 75% of the last half of the raid as SV due to KC bugs. Anyone notice anything weird that I didn’t catch tonight?